Posted in Desserts, on May 29th, 2017. Oh yummy. A tender, moist cake made with vegetable oil and applesauce. But this isn’t one of those that omits any other fat – the vegetable oil is in lieu of butter, obviously. But it’s super moist because of the home made applesauce added into the batter. 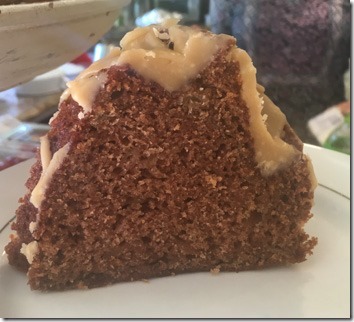 Needing a nice, big dessert to take to one of the Easter celebrations I attended (I was blessed to go to my son’s wife’s family celebration on Saturday, then on Sunday I drove to San Diego to be with daughter Sara), this recipe jumped out at me. Originally it was on Food52, but has since appeared a few other places as well. I have a new Bundt cakepan – a heritage one (but new, $36) that you can find on Food52’s website. It’s made by Nordic Ware, so you know it’s a good, solid cake pan. My older one I bought many years ago at a discounted place and it’s tweaked around the top edge, so it never bakes into a perfect round. Since I use it often, I decided I wanted this new shaped one. I bought Granny Smith apples, and used one Gala apple I had on hand too, but I used nothing but a little bit of water and cinnamon (no sugar), and it took about 10 minutes to make it. Well, except for the time peeling the apples. 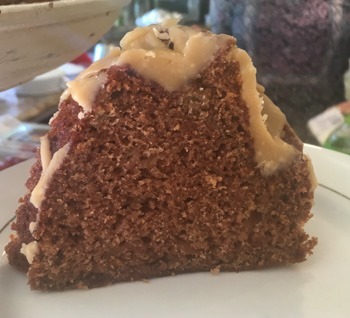 The cake contains 1 1/2 cups of the home made applesauce. You can use canned applesauce (unsweetened) and buy chunky if you can find it. I decided I wanted to make my own, and once cooked, I used a potato masher to make sure pieces were smaller. The cake itself has some nice, warm spices in it (including a small amount of ground black pepper, plus cinnamon, ginger and nutmeg). It uses dark brown sugar, hence the darker color of the cake. The black pepper isn’t really discernible, but am certain it wouldn’t be as tasty without it, so don’t skip past that ingredient. The cake baked in 45 minutes at 350°, and I tested the temp – it was exactly 206°F. Perfect. 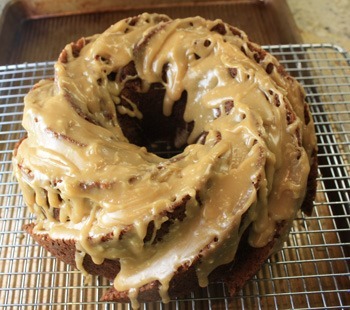 I let it cool overnight (loosely tented in plastic wrap, then made the caramel icing the next morning. I had one FAIL in this – my fault – I forgot to sift the powdered sugar, so you can see little bits of powdered sugar in the glaze. Not a deal breaker. The cake was easy easy to make. I made it a second time a few days later for another group of guests at my home. I pressed the powdered sugar through a sieve that time and got a much smoother icing/glaze. It was also just perfectly baked. Such a winner of a recipe. What’s GOOD: well, the texture (moist, tender) and flavor (lovely apple flavor throughout and the combo of spices are perfect). 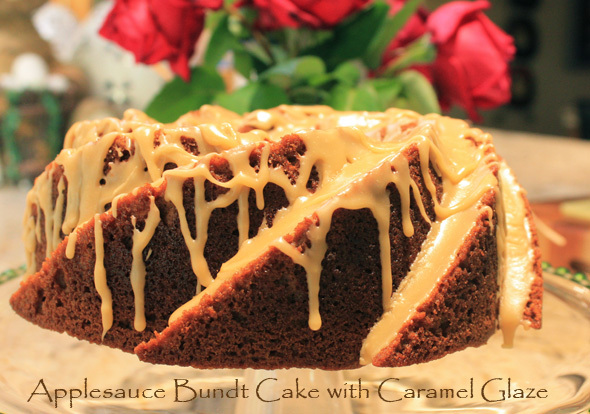 The caramel icing adds a nice fillip to the serving. It might be over the top with a little scoop of vanilla ice cream on the side. Don’t go the whipped cream route – it wouldn’t go with the icing, I don’t think. Altogether lovely cake – a definite keeper. I heard many uhmmmms from guests who ate it. 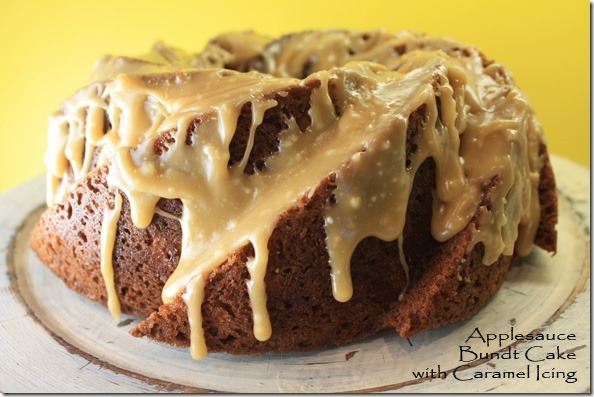 NOTES: You can use canned applesauce (chunky if possible) or make your own, but unsweetened. 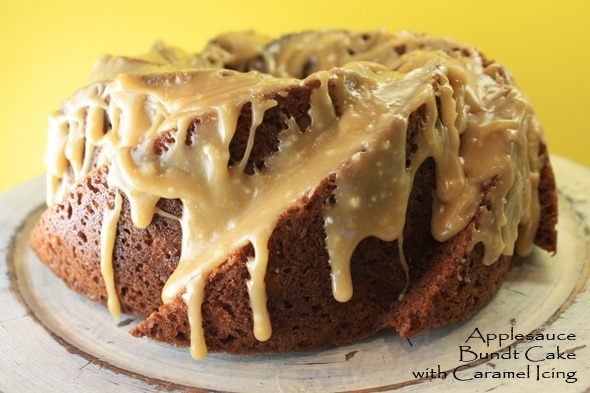 The icing is very sweet, so you don’t need added sugar in the applesauce. Do SIFT the powdered sugar or you’ll have lumps. 1. Position a rack in the middle of the oven, and preheat the oven to 350°F. Butter a standard-size (12-cup) Bundt pan (or spray with nonstick cooking spray). 2. In a medium bowl, combine the flour, baking soda, salt, pepper, and spices, and whisk to mix well. 3. In a large mixing bowl or the bowl of a standing mixer, beat the eggs with both sugars until light. Beat in the applesauce, oil, and vanilla until smooth. With the mixer on the lowest speed, add the flour mixture, and beat briefly, just to combine. Use a rubber spatula to fold gently, making sure that all the dry ingredients are incorporated. 4. Scrape the batter into the prepared pan. Bake for about 45 minutes, until a toothpick inserted in the thickest part of the cake comes out clean. 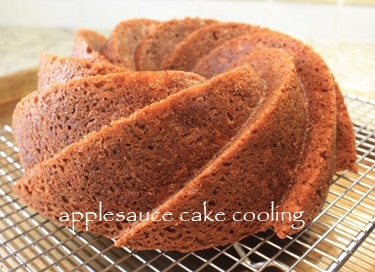 Cool the cake for 10 minutes in the pan on a rack before turning it out and allowing to cool completely. (The cake should be room temperature before applying the glaze). 5. When you’re ready to glaze, set the cooling rack (with the cake on it) on top of a rimmed sheet pan. This will catch drips. 6. Place the butter in a medium (2- to 3-quart) saucepan with the brown sugar, cream, and salt, and set over medium heat. Bring to a full rolling boil, stirring constantly. Boil for one minute exactly, and then pull the pan off the heat. Leave to cool for about 2-3 minutes, and then gradually whisk in the SIFTED confectioner’s sugar until you have a thick but pourable consistency. Only add as much sugar as you need to make a thick glaze. If it gets too thick, add a little cream to thin it down. 7. Immediately pour the glaze over the cake, evenly covering as much surface area as possible. Let the glaze set before serving the cake. Per Serving: 419 Calories; 19g Fat (41.2% calories from fat); 3g Protein; 59g Carbohydrate; 1g Dietary Fiber; 55mg Cholesterol; 375mg Sodium.